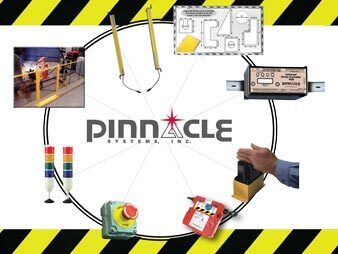 NSD | Safety Mat Systems | Pinnacle Systems Inc.
• Safety mats are designed to be machine interfaced with only controllers for normally open SPST 4-wire safety mats. • The safety mat has no rigid steel electrodes used in the switching mechanism that can rust and dent. 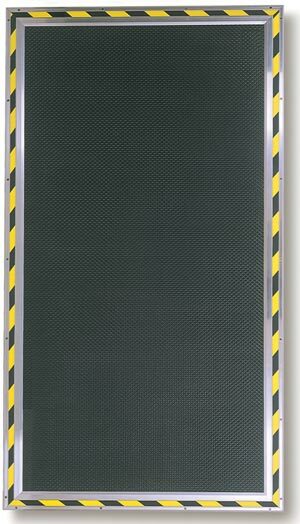 • The safety mat contains no wiring solder joints within the mat assembly that could degrade or short out. Wiring solder joints can fail under loads such as fork truck or hand cart traffic. • Flexible electrodes life cycle over 5,000,000 switch activations. • Safety mats provide increased reliability and safety with longer product life. • Customized wire exit positions available with no additional tooling costs. • flexible electrodes provide a product that is flexible and won’t kink or short out like rigid steel electrodes when bent. • Safety mats can use AC or DC input power. • Large single mat manufacturing process helps eliminate additional interconnect pieces required by others and simplifies installation. • Dual 20’ (6.1m) lengths of two-conductor, 22 gauge multistrand 300 VAC (four conductors total), CSA & UL Listed wiring per mat eases installation time. • Fast delivery on custom shapes and sizes with no need for special tooling costs. • Multiple zones in one mat housing available. • Designed specifically for the rigorous industrial environment. • Easy system to install. • No vacuum seal to break which induces rust and leads to dead zones. • Dual ribbed mat housing. • Non-skid or high temperature/wet environment mats available. • Hermetically sealed sensor system (NEMA 6, IP67). • Adapts well to uneven factory floor installations. • Custom engineered systems available. • Large selection of sizes and capabilities. • Maximum intermittent load on an mat is 3000 PSI. • Provides visual recognition of the guarded zone. • Warranty – 2 years.